There is one HVAC unit to cool all three of these rooms see diagram below. Solar heat loading on the cinder block wall is radiating into sleeping quarter 1 raising the temperature of this room. In order to make sleeping quarter 1 more comfortable the AC thermostat is being set to 66°F which is causing sleeping quarter 2 and the Living/Dining Areas to be very cold. Heat would radiate out of this wall through the night making sleeping uncomfortable. 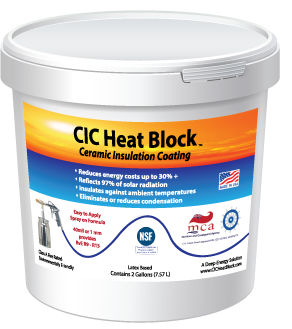 Goal: Apply CIC Heat Block to exterior wall of sleeping quarter 1 to block solar heat loading to allow the thermostat to be set higher and make all 3 rooms more comfortable. CIC Heat Block was applied to the west facing wall as shown in the diagrams above on September 12, 2017. The final coating of CIC Heat Block was tinted to match the building. However, the original color of this wall was a lighter color than the building. You can see the lighter color in the back portion of the wall visible in the picture above. 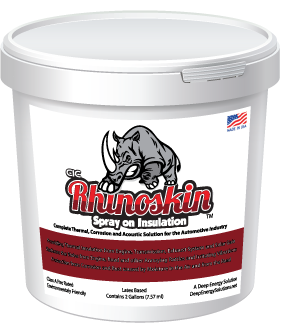 On some days the exterior wall measures at hotter temperature than before the coating was applied due to the darker color being a heat sink, but the interior wall was cooler due to the thermal insulating properties of the CIC Heat Block. On August 4th, 2017 the high temperature according to wunderground.com was 93°F. The exterior surface of the wall measured 132.2 °F with FLIR imaging gun. The interior wall measured 74.2°F. The thermostat was set to 66°F but the interior temperature was 76°F. This is 10°F higher than the setting causing the HVAC unit to run continuously. On October 6th, 2017 high temperature according to wunderground.com was 96°F. The exterior surface of the wall measured 144.3 °F with FLIR imaging gun. The interior wall measured 65.1°F. The thermostat was set to 68°F and the interior temperature was 68°F. The color of the coating matched the other sides of the building and was darker than the previous paint color on this wall resulting in a hotter exterior temperature but the inside temperature was still 9°F lower. Darker colors are more of a heat sink, lighter colors are better for reflectivity. 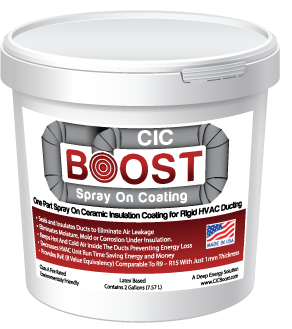 Click on the video below to see the application of CIC Heat Block on the wall.